When most people think of vacationing or taking a road trip to Branson, it isn't in the spring. Summer is a very popular time for Branson and, rightfully so! However, I want you to consider taking your first road trip of the year right now, this spring, to Branson, Missouri. Why would I make this suggestion? Branson is a very popular tourist designation in the summer and the hotels, pools, and roads are packed. It's hard to get into the best restaurants and even the crummy ones have lines. 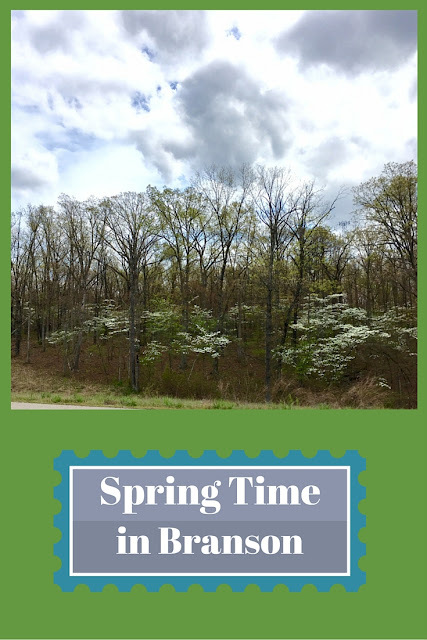 When you travel off season, you will find that some of the stress is taken away by the lack of crowds, plus the beautiful spring trees and flowers are in bloom! We drove from St. Louis to Branson via Interstate 44 which is also part of old Route 66. Of "get your kicks on route 66" fame. It is a beautiful road and in the spring you can catch sight of the dogwoods blooming. So gorgeous! We stayed in the Best Western Center Pointe Inn. Not necessarily by design, but that's another story for another time. However, the hotel was clean and a towel had been folded into an elephant and was sitting on our bed. There were 4 pillows per bed and the white sheets were fresh. While it wasn't our first choice, we had no complaints. The first night we were there we were able to get fantastic seats to see Six. Six was voted "Best Show in Branson in 2015." Six is a group of brothers who create all the music in their show with their voices. First seen in the 70s on The Donny and Marie Show, these brothers have had quite a history with their show. I highly recommend that you put this on your list. We had dinner on Friday at Florentina's Restaurante Italiano. This place is large and was pretty busy. The service was great and even though Bob's salmon dish wasn't prepared well, the chicken I had was very good. Fresh baked bread with olive oil and parmesan cheese is served when you sit down. Back to the room for our first night's rest. Saturday we a leisurely morning and splurged (calorie-wise) on these fabulous cinnamon rolls from Grandma Rose's Cinnamon Rolls. We were pleasantly surprised to have music at 9:00 in the morning, but there was a cowboy there singing cowboy songs. It was nice! In the afternoon we visited the National Tiger Sanctuary just north of Branson. What a fun event! We had a tour during feeding time (a snack) and learned so much from our tour guide. These animals are all rescued ones and they seem to be happy and healthy. I managed to get photos with them sticking out their tongues! I highly recommend that you add this to your Branson agenda. Dinner that night was at the Chateau on the Lake. Since we were visiting off season, we had no trouble getting reservations and our table had a lovely lakeview. We were impressed with the creativity of the chef, who designed these Lobster Stuffed Avocado Onion Rings with Chipotle Aioli and Fire Roasted Salsa. These rings were huge and there were three of them! Afterwards we went to the Titanic Museum. This is an awesome museum. When you enter, you get a card with the name of one of the Titanic passengers. Throughout the tour, you can see things that were on board, see a wonderful replica of the grand staircase, see a violin that was recovered years after the Titanic sank and other artifacts that survived the sinking. Knowledgeable staff can answer questions about the artifacts in the museum. At the end, there are two things that just make the whole thing so real: one is a list of the passengers and crew where you learn if your passenger survived or not, and two: a tank of water that is kept at the same temperature as the icy waters where the Titanic went down. You are invited to see how long you can comfortably keep your hand in the water. It's a very heart-rending moment. When you are ready to leave there is a lovely gift shop with very nice items. On Sunday we slept in a bit and then went to downtown Branson for breakfast. I remembered this restaurant from my early days in Branson and it was as I remembered. The food is simple, just one page of items but cooked perfectly. I highly recommend Farmhouse Restaurant. They provide fast service, so even if there is a line outside, go and check how long the wait is. You might be pleasantly surprised. We also thought the funny cashier was a bonus! We didn't get to swim in a pool, nor did we do any go carts, but we were able to see all the sights we wanted, we didn't wait in any lines and the traffic was bearable! 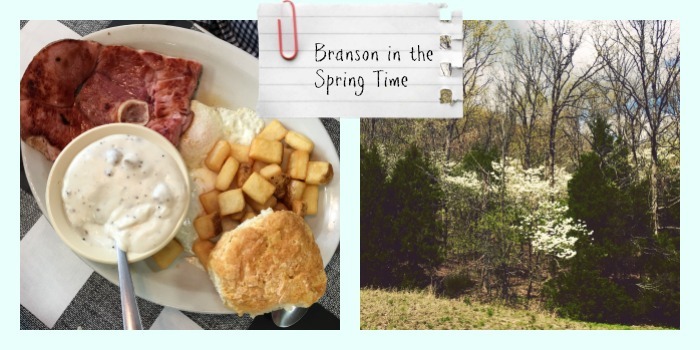 All good reasons to consider a springtime visit to Branson. Oh, and don't forget the dogwoods! So interesting that you took in the Titanic museum. We went to see the travelling show here in Edmonton and it was quite a sobering tour. My in-laws are from Newfoundland where a lot of the survivors went after the incident. I shudder at the thought that they are building a second one...you won't catch me on that boat! It's on my Bucket List! Someday I'm going to get there....I also want to go to Door County. Have you ever been there? I have and I loved it. If you go to Branson, let's meet up with Tammy. To be honest I've never thought about visiting Branson before. If I lived closer it would def be on my list though. Sounds amazing. I wish we would have been there at the same time! How fun would that have been!! Looks like a really fun day out. My husband and I love to do day trips! It's a lot of fun, isn't it! Such a delightful getaway you had! I'm a fan of visiting in the off season, much more enjoyable and less stressful! That cinnamon roll looks so delicious...I kind of wish my computer screen was scratch-n-sniff!! And I love spring-time travel!!! I love the scratch and sniff idea! The tiger sanctuary is stunning. I love that even though you missed a few things like swimming in a pool off your list you still managed to see all the sights! You should. Branson has so much to do. It's kinda crazy that all this is here in Missouri! That looks like you had a great trip. I definitely hope to visit Branson one day. I have actually never considered going to Branson whatsoever but now that I'm reading about this I might consider it sometime in the future. Sounds like a great place to visit. I love cinnamon rolls. That looks amazing. My friend dances in some shows in Branson. I've heard it's a fun little place to go! Wow, that's awesome. Lots of performers live in the Branson area. Looks like you guys had an awesome time! I definitely want to visit soon! I hope I brought back fond memories! I'd never heard of Branson Missouri before. What a great place. I love the tiger sanctuary. Looks like you had a fab day. We went to Branson last year for a week and I hope we can do it again this year. Titanic museum was definitely a hit with the kids and so was the wild place where my kids fed the sharks (on the same street) and the show with the horses the name of which escapes me now. Sounds like a fun trip. My husband is from MO but I don't think he ever went to Branson. These are definitely some great tips! Branson is one place I have never been. Looks like I'm missing out! Branson looks like it is the perfect place to spend some time away and enjoy all it has to offer. I am desperately in need of a vacation or getaway and would love to visit sometime soon. Sounds like a fun trip! I've only been to Branson once and that was a long time ago. Would love to go back again. I've always wanted to go to Branson. And you make it sound so enticing. I've heard a lot of good things about Branson. I wouldn't mind going there!